German architecture prior to the modern period has received less systemic, analytical study than that of Italy, France, and Britain. Scholarly discussion of broad traditions or continuities within Germanic or Central European façade design is even sparser. Baroque era studies of the region mostly devote themselves to isolated architects, monuments, or movements. Modernism's advent decisively changed this: Germanic architecture enjoyed sudden ascendancy. Yet, even so, study specifically of that region's façades still lagged – nothing compares to the dozens of treatments of Le Corbusier's façade systems, for example, and how these juxtapose with French neoclassical or Italian Renaissance methods. Given the paucity of multi-period studies, one can be forgiven for believing Germany's effervescence of radical, modern works seems unprecedented. This book takes up these multiple quandaries. It identifies and documents a previously unrecognized compositional tradition - characterized here as the 'screen façade' – and posits it as a counter-narrative critiquing the essentialist, 'authentic' canon currently dominant in Western architectural history. By crossing evenly over the dividing line between the historical and modern periods, it offers valuable insights on indigenous roots underlying some aspects of Germany's invigorating early twentieth-century architectural developments. 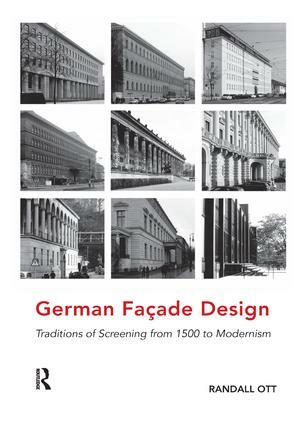 The book chronologically examines 400 years of closely related facades, concentrated in Germany but also found in Austria, the Czech Republic, German-speaking Switzerland, and nearby areas of Central Europe. While nearly 75 buildings are mentioned and illustrated, a dozen are given extensive analysis and the book focuses on the works of three architects – Schinkel, Behrens and Mies. Relationships between examples of these three architects' façades far transcend mere homage amongst masters. Glimmers of the system they eventually codify are apparent as early as at Heidelberg Castle in 1559 and Nürnberg's Rathaus in 1622. The book argues that in Germany, northern Gothic affinities for bisection, intense repetition and rote aggregation intersected with southern Classical affinities for symmetry, hierarchy and centrality, thereby spawning a unique hybrid product – the screen. Instead of graphic formality, this study is guided by on-site perceptions, propositional contrasts, means of approach, interpretive conflicts and emotion and it relates the design of these façades to concepts proposed by contemporary philosophers including Novalis, Hegel, Nietzsche, Freud, Adorno, and, most importantly, Gadamer on hermeneutics. Randall Ott, AIA, is an architect and educator who since 2003 has served as Dean of the School of Architecture + Planning at The Catholic University of America, in Washington DC. He has written widely on Modernism in central and northern Europe, publishing book chapters, articles, book reviews and encyclopedia entries. Particular emphases have been on the work of Mies van der Rohe, Karl Friedrich Schinkel and Germany. He has also made more than 30 scholarly presentations and lectures in those areas of study. For many years he served on the Editorial Board of the Journal of Architectural Education, reviewing articles on those topics. His interests often undertake a juxtaposition of wider cultural manifestations with architecture, such as his chairing of the Association of Collegiate Schools of Architecture's 1997 international conference in Berlin, entitled Building as a Political Act. As an architect, for the past two decades he has been involved in theoretical studies of the design of sacral and honorific spaces. For his work with theoretical chapels, he has won three Faculty Design Awards from the Association of Collegiate Schools of Architecture.